More than half of US adult Internet users (54 percent) post original photos or videos online that they themselves have created, while just under half (47 percent) take photos or videos that they have found online and repost them on sites designed for sharing content. These numbers are both up from 46 percent and 41 percent last year, respectively. The latest figures come from Pew Research Center’s Internet Project. The first group of creators (those who post their own original content) can be further broken down into those who have posted photos they have taken themselves (52 percent) and those who have posted videos they have taken themselves (26 percent). Yet the really interesting part is what apps cell phones owners are using to upload this content. According to Pew, 18 percent are on Instagram and 9 percent are on Snapchat. Unfortunately, this is the first time Pew has asked cell phone owners about Instagram and Snapchat, so it’s not yet possible to look at growth rates. Twitter’s Vine app was presumably not included because it only covers video, while Instagram and Snapchat are both capable of uploading and sharing photos as well as videos. While this is certainly understandable, it would have been great to include the likes of Facebook in this survey. 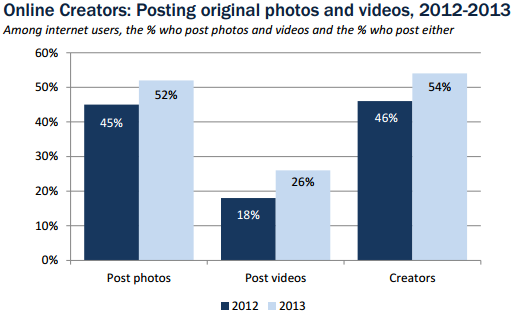 Are cell phone owners uploading more or less photos and videos to Instagram than to Facebook? What about Snapchat? Pew’s study was conducted between October 6 and October 13 by surveying 1,000 adults aged 18 and older. The organization pegs the margin of error at plus or minus 4.0 percentage points for Internet users and 3.8 percentage points for cell phone owners. You can read the whole 16-page report here: Photo and Video Sharing Grow Online (PDF).